Choose from wide range of designs available in digital print also if you do not like our design you can give your design to be printed. The Fabric Of the Product is Cotton Net. 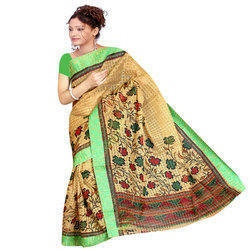 The Color of this beautiful Saree is Yellow. The product is Dual checked and cross examined before packing. We supply quality assured products. The collection is regularly updated with more various trends and our fashion artist designs the collection looking upon the use of the product. The style of this product is Printed. The Size Is Free Size (Upto XXL). The Stitch type of the product is Unstitched. Disclaimer: The product pictures are indicative of the offers and may differ slightly with actual products. Disputes, if any, subject to Anantrangmarketplace policies.Anantrang reserves the right to withdraw, change, & modify the terms and conditions as well as offers any time without any prior notice. Legal Disclaimer: The model is not to take anything with the product. Only for reference purpose. Wash Care: Wash in domestic or commercial machine in water not exceeding 70°C, at normal setting. Tumble dry no heat/air dry. After extraction of excess water, line dry/hang to dry. Dry in the shade. Do not iron or press. Dry-clean, normal cycle. Any solvent except trichloroethylene. Do not wring. 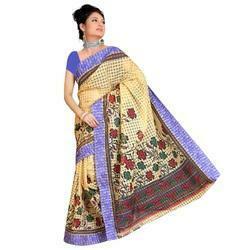 The Fabric Of the Product is Banarasi Cotton. The Color of this beautiful Saree is Yellow. The product is Dual checked and cross examined before packing. We supply quality assured products. The collection is regularly updated with more various trends and our fashion artist designs the collection looking upon the use of the product. The style of this product is Border Work. The Size Is Free Size (Upto XXL). The Stitch type of the product is Unstitched. Disclaimer: The product pictures are indicative of the offers and may differ slightly with actual products. Disputes, if any, subject to Anantrangmarketplace policies.Anantrang reserves the right to withdraw, change, & modify the terms and conditions as well as offers any time without any prior notice. Legal Disclaimer: The model is not to take anything with the product. Only for reference purpose. Wash Care: Wash in domestic or commercial machine in water not exceeding 70°C, at normal setting. Tumble dry no heat/air dry. After extraction of excess water, line dry/hang to dry. Dry in the shade. Do not iron or press. Dry-clean, normal cycle. Any solvent except trichloroethylene. Do not wring. The Fabric Of the Product is Georgette. The Color of this beautiful Saree is Pink. The product is Dual checked and cross examined before packing. We supply quality assured products. The collection is regularly updated with more various trends and our fashion artist designs the collection looking upon the use of the product. The style of this product is . The Size Is Free Size (Upto XXL). The Stitch type of the product is Unstitched. Disclaimer: The product pictures are indicative of the offers and may differ slightly with actual products. Disputes, if any, subject to Anantrangmarketplace policies.Anantrang reserves the right to withdraw, change, & modify the terms and conditions as well as offers any time without any prior notice. Legal Disclaimer: The model is not to take anything with the product. Only for reference purpose. Wash Care: Wash in domestic or commercial machine in water not exceeding 70°C, at normal setting. Tumble dry no heat/air dry. After extraction of excess water, line dry/hang to dry. Dry in the shade. Do not iron or press. Dry-clean, normal cycle. Any solvent except trichloroethylene. Do not wring. The Fabric Of the Product is Georgette. The Color of this beautiful Saree is Black. The product is Dual checked and cross examined before packing. We supply quality assured products. The collection is regularly updated with more various trends and our fashion artist designs the collection looking upon the use of the product. The style of this product is Border Work. The Size Is Free Size (Upto XXL). The Stitch type of the product is Unstitched. Disclaimer: The product pictures are indicative of the offers and may differ slightly with actual products. Disputes, if any, subject to Anantrangmarketplace policies.Anantrang reserves the right to withdraw, change, & modify the terms and conditions as well as offers any time without any prior notice. Legal Disclaimer: The model is not to take anything with the product. Only for reference purpose. Wash Care: Wash in domestic or commercial machine in water not exceeding 70°C, at normal setting. Tumble dry no heat/air dry. After extraction of excess water, line dry/hang to dry. Dry in the shade. Do not iron or press. Dry-clean, normal cycle. Any solvent except trichloroethylene. Do not wring. The product pictures are indicative of the offers and may differ slightly with actual products. Disputes, if any, subject to Anantrang marketplace policies. Anantrang reserves the right to withdraw, change, & modify the terms and conditions as well as offers any time without any prior notice. Legal Disclaimer : The model is not to take any thing with the product.Only for reference purpose.